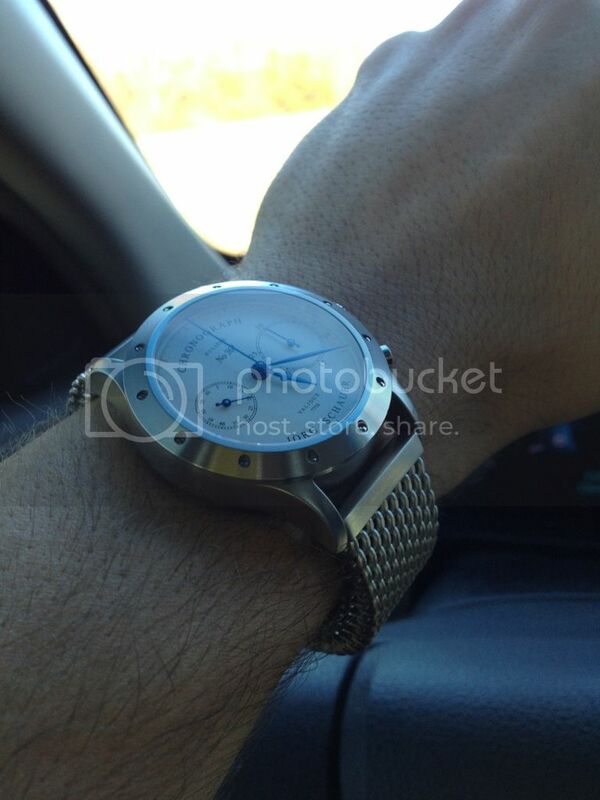 I was hoping you would post a pic of your watch with the Artus bracelet. It looks fantastic,good call. This is my Stowa Flieger No Logo COSC that I'm proud to wear daily. All as originally received from Stowa, and still looking fresh two years later, even if I'm not. I've lost count of the people who've remarked on it, and keep in mind that Switzerland (where I live) is the ground zero of the fancy watch world. Renisin and Ken Copen like this. That certainly is a fine looking fleiger you have and you can't beat that COSC movement for beauty! Heres my B-Dial version. Last edited by Renisin; October 27th, 2012 at 17:04. That B dial of yours is therefore the very closest relative of my A dial that Stowa has to offer. Gorgeous, by the way. But I'm waiting on Jörg to offer another sterile Flieger Original with an exhibition back, and I'll pounce on that first. I've been begging Jorg to build a Fleiger Original in a B-Dial 44mm case forever,I hope he does and I'll be the first to order! Now that would be the watch to have. Oh, my word, you're right. Producing a B dial Flieger Original would be a very sweet spot indeed. Right *after* he builds me an FO A dial. And then I'll take 'em both, one after another. Amen brother!! Both it is. Renisin, naunau, ddthanhbb and 1 others like this. feel like sitting in a cockpit! naunau and cheapshades2012 like this.